Pongal is the main harvest festival celebrated in Tamil Nadu. 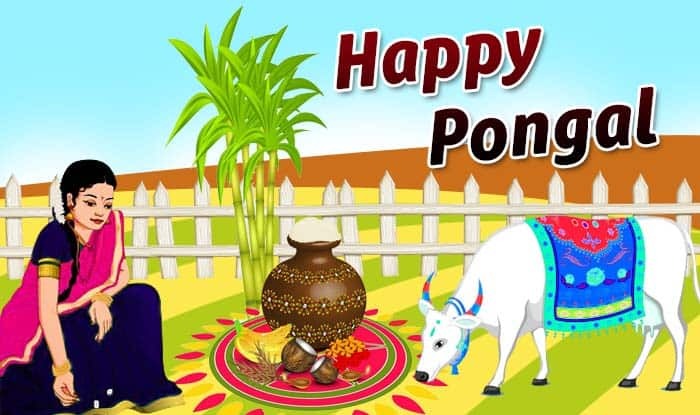 It is a 4 – day long pongal festival, which falls in the month of Thai according to the Gregorian calendar is usually celebrated in January-February when the crops like rice, sugarcane, turmeric, etc. are harvested! Pongal is the only festival in the Indian calendar that derives its name from the dish of sweetened rice. A sweet called Pongal-dish (made of rice, green gram, cardamom, jaggery, raisins, & cashew nuts) is prepared as part of the festival and is regarded as an offering to Sun God! This 4-day festival coincides with the Kite Festival (Makara Sankranthi), a winter harvest festival which is celebrated throughout India! The decor items used during Pongal are usually “Green.” Here green refers to all the things of harvest like banana leaves, mango leaves, sugarcane sticks, etc. Sugarcane is mainly important for Pongal activities & decorations. This is because it is the main harvest for this season. Apart from that, a stem holding five mango leaves is considered holy by Hindus. These leaves are usually used to decorate the pot in which Pongal is prepared! The very first day of pongal festival is called Bogi Pongal, where people worship Sun God (Surya Devta) & Mother Earth. The first paddy harvested is cooked to make rice, that is, boiling milk with rice, this is also the special dish for the occasion. The second day of pongal festival is called the Perum Pongal or Surya Pongal. This is the most important day of all the four days where Surya is worshiped along with his consort Chaya. People wear new clothes on this occasion & it is customary to light a fire & they throw all old & torn clothes into it. The third day of pongal festival is called the Mattu Pongal where the animals involved with the agricultural community or practice like cattle are worshiped. They are bathed, cleansed, massaged & dressed in vibrant coloured attires made especially for them. The fourth day of pongal festival is called the Kanum or Thiruvalluvar Pongal. On this last day, people visit their friends & relatives. Puja is performed by a woman of the house praying for a well being & prosperity of their brothers. An interesting custom is to leave some cooked rice on banana leaves for the birds to feast on! If you look at the pongal festival from a very practical point of view, you will find that it has a tremendous relevance due to the fact that the Sun, Mother Earth & cattle are worshiped. Tamil Nadu is a state that is lacking any perennial water resource & so people invoke the blessings of a sun & rain gods asking for their kindness! Apart from these traditional festival and celebrations, there are several other ways to decorate your own home for Pongal. Check out some ideas to liven up your home with the spirit of this Harvest Festival! The main attraction of the Pongal festival is the kitchen or the front yard/backyard. The pot is decorated & all the decorations surround this Pongal pot. Many Rangoli designs are made around the pot & the cooking fire. 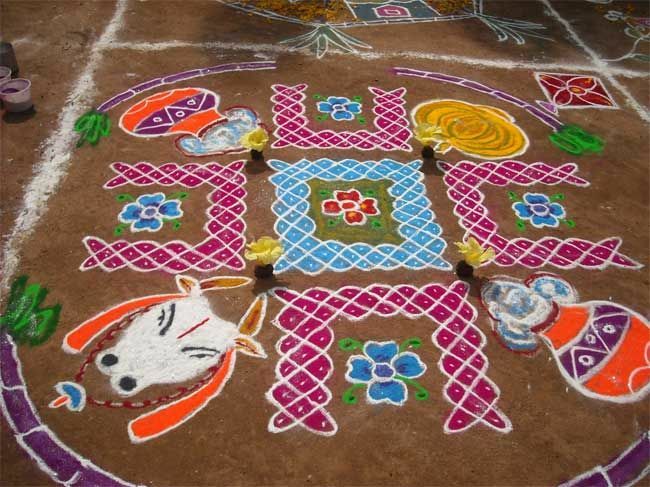 The particular Tamil rangoli design is made called Kolam. Pongal is usually cooked in an earthen pot as shown in the figure. The pot is usually painted with different coloured designs. The Pongal feast is spread out on banana leaves. See how you can make an art of serving food in the traditional method. 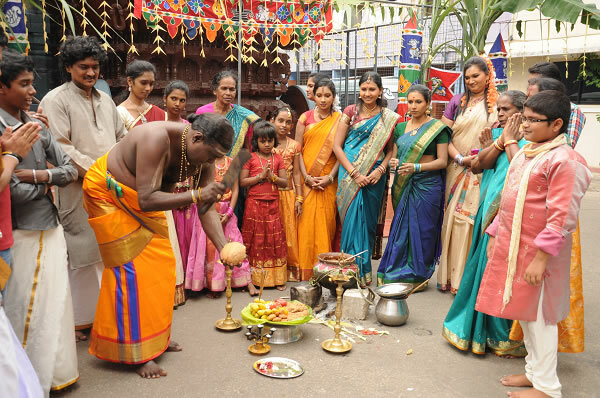 It is a place where you cook the Pongal with all the decoration around the area. 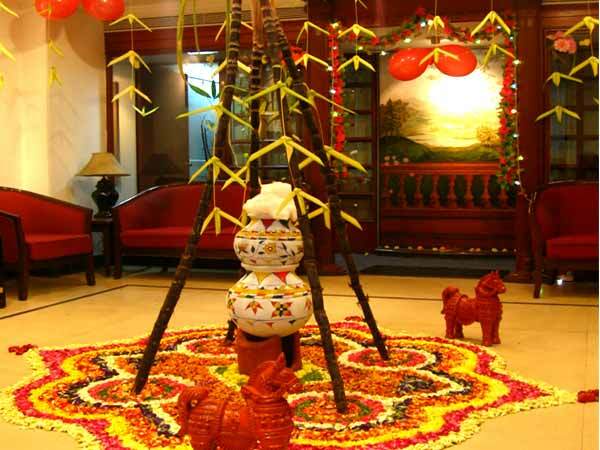 To complete the Pongal decoration, you need to have long sugarcane sticks. Choose the ones with the leaves on top for some frills! The 4 days of Pongal festival involves worshiping cow which is the holy to Hindus. So, you can make some innovative kolam (rangoli) that looks like a cow! Every homemaker knows how to make Kolam in Tamil Nadu. So if you can come up with some innovative designs, you can outshine your neighbours :)! If you are living in a city & stays in an apartment, then brewing Pongal in your backyard may be a troublesome. For you, the best option is the indoor Pongal as shown in figure. Apart from these traditional decorations, you can also brighten up or decorate your house with the electric lights. The above ideas will really help you to how to decorate your house & celebrate all pongal activities in ritual manner! Previous PostPrevious Home Interior: False Ceiling Types!